Cyber Crime and Cyber Terrorism Investigator’s Handbook is a vital tool in the arsenal of today’s computer programmers, students, and investigators. As computer networks become ubiquitous throughout the world, cyber crime, cyber terrorism, and cyber war have become some of the most concerning topics in today’s security landscape. News stories about Stuxnet and PRISM have brought these activities into the public eye, and serve to show just how effective, controversial, and worrying these tactics can become. Cyber Crime and Cyber Terrorism Investigator’s Handbook describes and analyzes many of the motivations, tools, and tactics behind cyber attacks and the defenses against them. With this book, you will learn about the technological and logistic framework of cyber crime, as well as the social and legal backgrounds of its prosecution and investigation. Whether you are a law enforcement professional, an IT specialist, a researcher, or a student, you will find valuable insight into the world of cyber crime and cyber warfare. 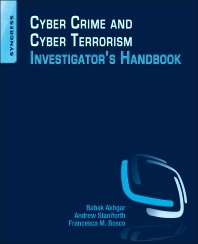 Edited by experts in computer security, cyber investigations, and counter-terrorism, and with contributions from computer researchers, legal experts, and law enforcement professionals, Cyber Crime and Cyber Terrorism Investigator’s Handbook will serve as your best reference to the modern world of cyber crime. Chapter 1: Cyberspace: The new frontier for policing? Has Cyber Terrorism Ever Occurred? User Requirements and the Need for a User-Centered Approach? What Are the Classifications and Types of Cybercrime? Who Offers Cyber Liability Insurance and What Should Customers Look Out For? Babak Akhgar is Professor of Informatics and Director of CENTRIC (Center of Excellence in Terrorism, Resilience, Intelligence and Organized Crime Research) at Sheffield Hallam University (UK) and Fellow of the British Computer Society. He has more than 100 refereed publications in international journals and conferences on information systems with specific focus on knowledge management (KM). He is member of editorial boards of several international journals and has acted as Chair and Program Committee Member for numerous international conferences. He has extensive and hands-on experience in the development, management and execution of KM projects and large international security initiatives (e.g., the application of social media in crisis management, intelligence-based combating of terrorism and organized crime, gun crime, cyber-crime and cyber terrorism and cross cultural ideology polarization). In addition to this he is the technical lead of two EU Security projects: “Courage” on Cyber-Crime and Cyber-Terrorism and “Athena” onthe Application of Social Media and Mobile Devices in Crisis Management. He has co-edited several books on Intelligence Management.. His recent books are titled “Strategic Intelligence Management (National Security Imperatives and Information and Communications Technologies)”, “Knowledge Driven Frameworks for Combating Terrorism and Organised Crime” and “Emerging Trends in ICT Security”. Prof Akhgar is member of the academic advisory board of SAS UK. Andrew Staniforth, Detective Inspector and Advisory Board Member and Senior Research Fellow, Centre of Excellence in Terrorism, Resilience, Intelligence and Organised Crime Research (CENTRIC). Francesca Bosco, Project Officer on Cybercrime and Cybersecurity at UNICRI. Project Officer on Cybercrime and Cybersecurity at UNICRI.